Hello everyone. Thank you for joining us in this fun and festive craft event! 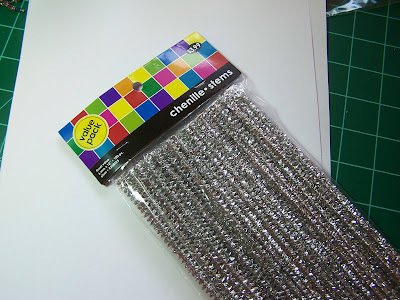 I'm happy to share a simple technique for making regular silver tinsel pipe cleaners look as though they are tarnished. I must admit I'm a sucker for pipe cleaners. Not sure if anything has ever been made to rival their versatility in craftdom. The only thing is they are just too pristine for me so I decided to beat them up a bit. 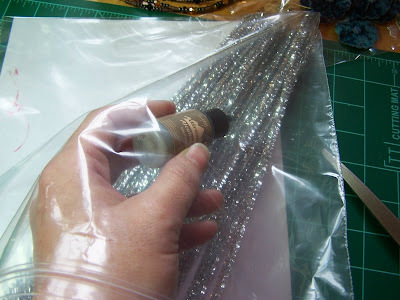 Start with silver tinsel stems from Hobby Lobby or any craft store. I'm going to show you how I dye a single stem so you will know how to experiment with various color combinations without wasting lots of dye and stems. At the end of the tutorial, I'll show you how I dyed a larger quantity and show you another color combo. 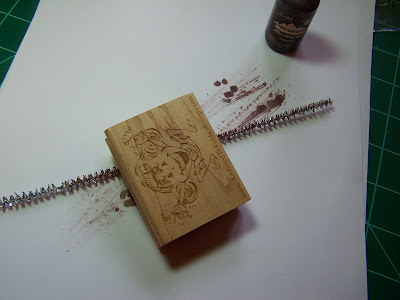 For one stem you will need a wood block or something similar. 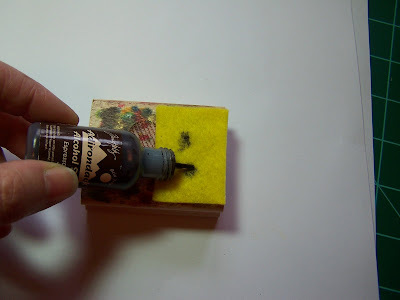 (This technique is identical to Tim Holtz faux marble technique if you are familiar). Add some velcro to the block. The plastic, meshy side of the velcro. 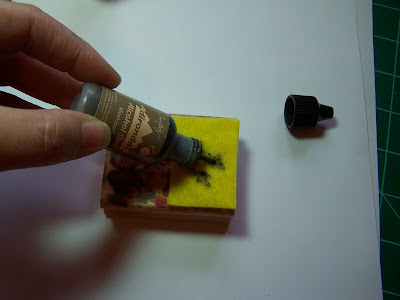 You will need Tim Holtz Alcohol Inks in mushroom, espresso and butterscotch to get the deep brown/bronze/gold color you see on very old, tarnished metal tinsel. 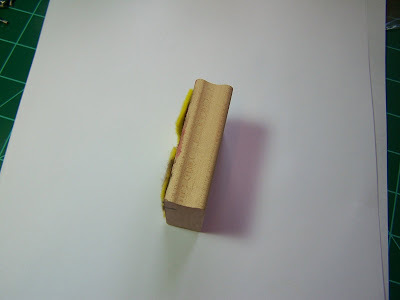 Cut felt pieces to fit on the block. Stick the felt to the velcro then apply 8 or 10 dots of espresso ink. Then about 6 or 8 dots of mushroom. Here's what the felt will look like when you've applied both the espresso and mushroom inks. 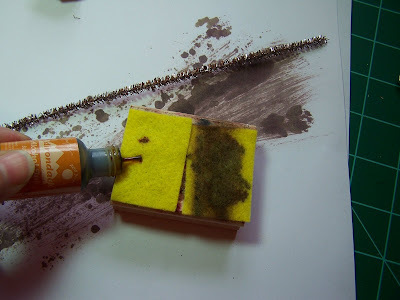 Now, attach a clean piece of felt and dot it with butterscotch ink. Five or 6 blots will should do it. Go at the pipe cleaner again only DO NOT do the rubbing in a back and forth motion. Just blot the butterscotch here and there as desired. You don't want too much butterscotch. The gold should be like a whisper. If it ends up looking too gold just go over some of the butterscotch areas with more espresso. NOTE: In place of the butterscotch ink you can also use a gold leafing pen or a metallic gold paint pen (not a pigment pen, but a true metallic paint pen like what Elmer's makes). 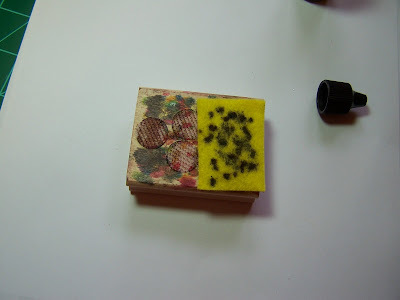 In this case you would push the pen onto the clean felt making about 6 or so dots then blot as described above for the butterscotch step. Here's how you do a large quantity. Stick about 20 or so stems in a large baggie or cello bag. Take the ink bottle inside the bag and squirt generously all over the top of the stems. It needs to be heavier on the espresso than on the mushroom. Generously squeeze both inks in and start quickly squishing and mushing them all around inside the baggie. 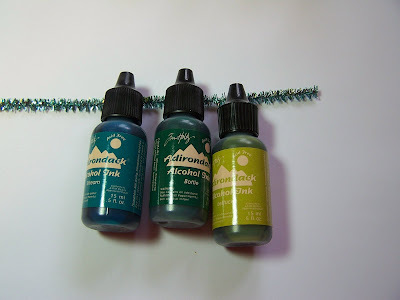 You will need to reach in and add more of both inks and squish and mush to the desired color. Next add maybe 1/4 or less of the butterscotch and mush it around. If the color is too gold add more espresso. Spread them out on a paper to dry. Drying time is very fast for alcohol inks so work quickly. The greatest thing about the inks is they are pretty much mistake proof. 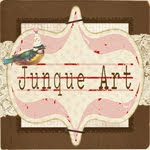 Wonderful to work with and I highly recommend you have them as a staple in your craft room. Excellent for dying any non-porous substrate. Your hands are going to be a mess after the baggie dying. Clean them off with alcohol and then wash your hands with soap and water. Here is a color variation using Tim's Alcohol inks in Stream, Bottle and Lettuce. Very pleased with this look. I only did one so that makes it hard to see the lovely color. You need a stack of them in order to properly photograph the color. If you use this color combo, use stream in place of espresso; bottle in place of mushroom and lettuce in place of butterscotch. Probably need a bit less lettuce than we used in the butterscotch above. 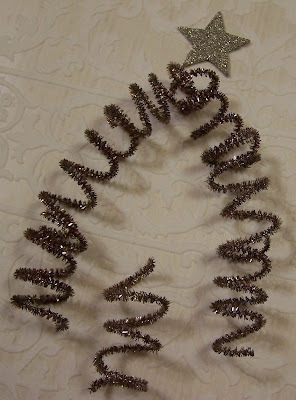 These tinsels are really super pretty and I will show you a large quantity on my blog in the next few weeks. I've also figured out a way to make pink. It's a little different, but very doable. I'll try to make the pink tinsel stems my final Joli Paquet tutorial which is later in the month. Hope you enjoy messing with Tim's inks. They are a remarkable invention. 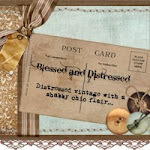 Tim Holtz is one seriously innovative crafter. Love him and all the products he's created! 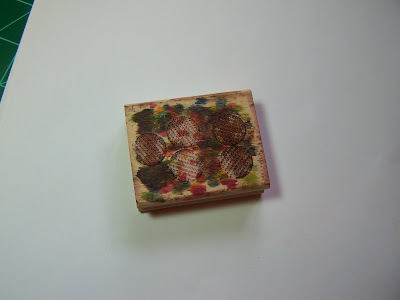 Thank you Tim Holtz! 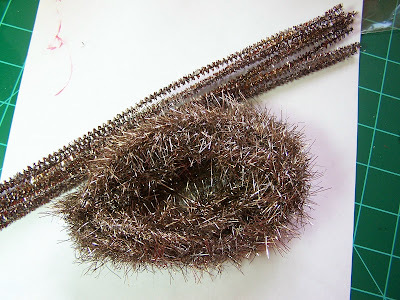 Brandy, one of my fellow Joli Paquet artists sells absolutely gorgeous tarnished tinsel stems in her etsy shop. For most people it would be much easier to just go buy the stems. 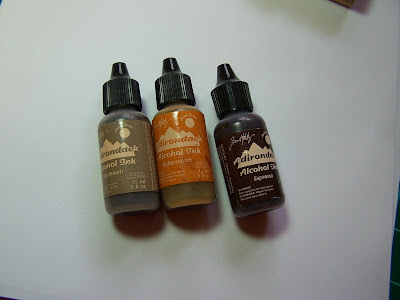 They are very useful and the alcohol inks are a bit pricey if you don't already own them. Just go see Brandy for all your tarnished tinsel needs. 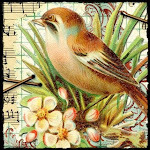 You can't beat her price and you won't have to do a stinkin' thing other than click a few buttons along with a little light typing:) Brandy has an incredible shop filled with innovative and useful supplies. She also sells beautiful tarnished tinsel garland. So happy she's offering this because I hoard my antique tinsel, plus it makes your hands stink! I can't wait to try this! I hoard the old stuff too so maybe now I don't have to be so stingey with it. Donna, Great tutorial! And I love getting my hands messy! I think I already have tinsel and inks so I'll be seeing what I come up with! Cool! I cannot wait to try this (probably on everything that is too shiny). Thanks! WOw!! that was very informative. I have to try that. Thanks!!! this is soooo awesome !!! thanks so very much , i just love alcohol inks ! Oh this is so much fun, I love it! Perfect for Christmas! I'll be linking to this. that is SO cool!!! i can't wait to try this Donna!!! Wow! Very cool. Thanks for the tutorial. Can't wait to try it! My first time coming here! Thanks for your wonderful ideas!! 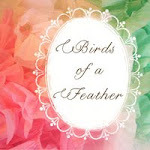 come see my blog... 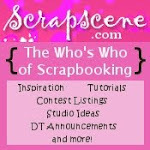 I have a great giveaway going on right now! Thanks SO much for this tutorial! I had only used shoe polish in the past to age the tinsel and I can't wait to try the mix of alcohol inks which seems much more interesting. I look forward to seeing all the offerings from the artists this weekend! Wow this is fantastic Donna! I can hardly wait to try it! OMG! I love this technique. I hadn't even thought about those alcohol inks I have in my stash, and this worked out so great. I got a vintage green with meadow and pesto, and a nice light green with plain lettuce. Much better than the colored stems they sell. Thanks!